Most sun-seeking visitors to Italy make a beeline for the obvious coastal getaways: Capri, Amalfi and the Cinque Terre. But beyond these famous shorelines, Italy abounds with equally beautiful and tourist-free beaches, in places you'd never expect. From the Tuscan countryside to the craggy cliffs of Marches, you'll find many spectacular hidden beaches - that you'll have all to yourself. Thanks to the attention heaped on Tuscany's famous countryside, its coastline has remained fairly under the radar. 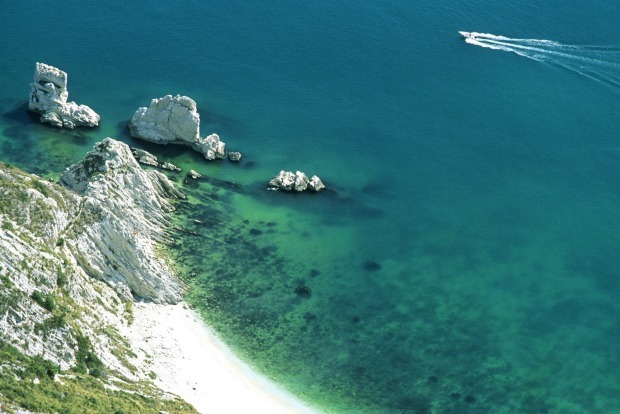 Consequently, Tuscany's beaches are some of the most wild, unspoiled and beautiful in the country. Spiaggia di Sansone is located on Isola d'Elba, just a short ferry ride from the region's rolling hills and vineyards. The beach might lack Capri's polished glamour - and that's exactly why you should visit. Instead of glitzy resorts, it's backed by prickly Mediterranean shrub and limestone cliffs; its sand isn't silky nor powdery, but peppered with smooth white pebbles. Best of all, Sansone's crystalline waters remain uncrowded all year round, save for a handful of locals in the summertime. 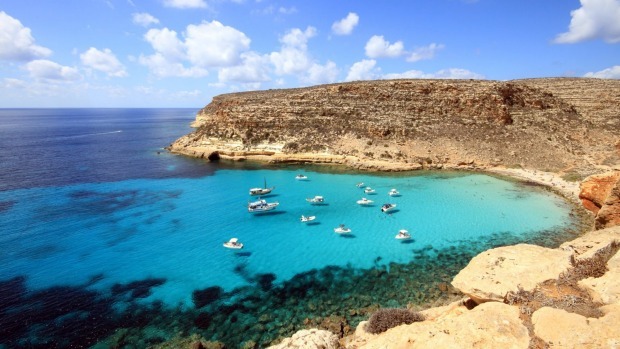 Getting to Cala Pulcino is not convenient: you'll need to take a ferry from Sicily's Porto Empedocle to Lampedusa, and then hike over hot, sun-bleached rocks and thick vegetation for 30 minutes to arrive at the beach itself. That said, it's well worth the trek. You'll descend upon a quiet, white sand cove with terrific views over the Mediterranean, which you'll most likely have all to yourself. 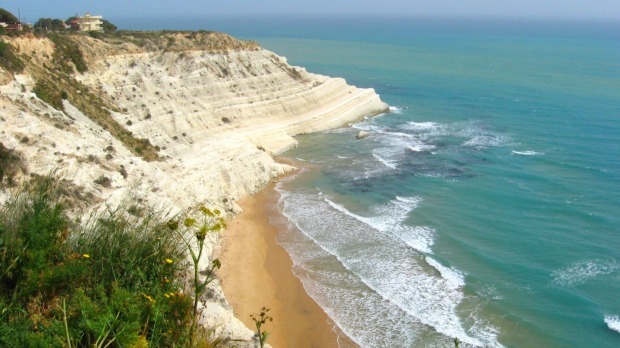 Fun fact: though Cala Pulcino is considered part of Sicily, it's actually much closer to Tunisia than it is to Italy - which explains the arid, desert-like topography you'll have plowed through to get there. During the summer, tourists flock to Rome, and the Romans flock here, to the staggeringly scenic Spiaggia di Chiaia di Luna - a narrow strip of sand at the base of a 100-metre volcanic cliff shaped like a half moon, hence its name. 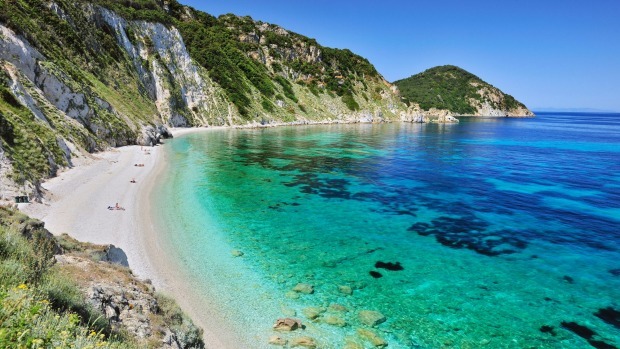 To get there, you'll need to catch a ferry from Anzio (an hour from Rome) to Ponza, and cross the island via a half-kilometre tunnel that, thankfully, spits you out right on the beach. But, like Cala Pulcino, it's worth the effort: the view of Chiaia di Luna from the water is almost otherworldly, and you won't find a better sunset vantage point than from its sandy, sheltered shore. Spiaggia Bidderosa's rugged beauty feels worlds away from the glitzy resorts of celebrity-packed Costa Smeralda, a little further north. Being part of the Bidderosa Nature Reserve, it remains unspoiled and perpetually deserted - though it probably helps that you have to pay an entrance fee and then hike for 40 minutes through a thick pine forest just to get there. But upon arrival, you'll be rewarded by the same silky sand and balmy, Caribbean-blue waters shared by the more famous Capriccioli and del Principe beaches nearby - minus the crowds. Spiaggia del Due Sorelle, or the "Beach of the Two Sisters," is part of central Italy's Riviera del Coneroa picturesque swath of coast largely overshadowed by the more popular Italian Riviera, home to Portofino, Lerici and the Cinque Terre. Spiaggia del Due Sorelle is only accessible by boat from Porto Numana and, as a result, remains refreshingly undeveloped. You won't find any food vendors, snorkel gear rentals or shower facilities here - just soaring limestone cliffs, silvery sand and the cool, translucent waters of the Adriatic. The chalky, tiered marlstone cliffs of Scala Dei Turchi - the "Stair of the Turks" - are considered one of Sicily's greatest natural wonders. You'll need to hike all the way down to its base to access the beach: a long, jagged stretch of bronze sand that locals claim is rich with minerals. Do as they do and coat your body with the wet, muddy sand, and then rinse off in the warm Mediterranean ocean. Don't forget to look behind you; you won't get a better view of southern Sicily's strange, spectacular landscape anywhere else. 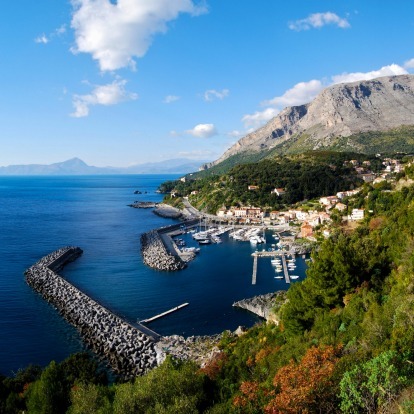 Though the town of Maratea in Basilicata is considered the "Pearl of the Tyrrhenian," it's generally overlooked by many tourists in favour of the Amalfi Coast and other southern Italian beaches - which just gives you all the more reason to visit. 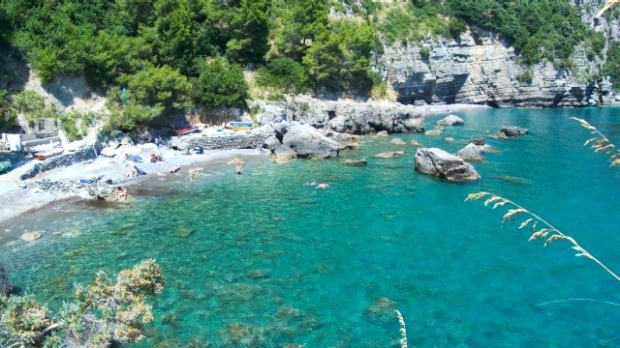 Of Maratea's many secluded coves and beaches, its most striking is Spiagga Macarro. Macarro is favoured by locals for its inky, jet-black sand - similar to the volcanic black sand beaches of Kauai - and intensely turquoise waters, which are rich with fish and perfect for snorkelling. Despite being located on the tourist-congested Amalfi Coast, Spiaggia di Tordigliano remains unspoiled and commonly unfrequented due to its concealed location - it's only accessible by yacht, or by a rocky, two kilometre-long hillside trail. 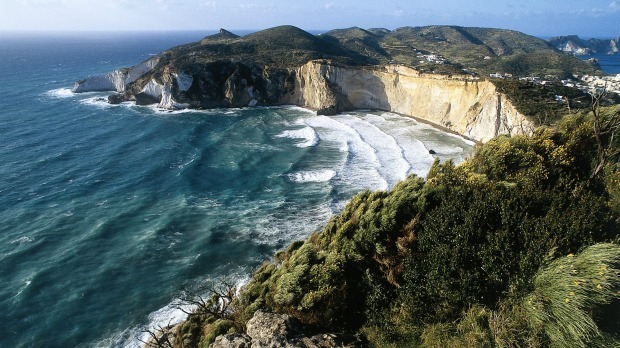 As a result, Tordigliano is one of the few undeveloped beaches in the Sorrentine Peninsula, blessed with a wild, pebbly shore and flanked by craggy granite cliffs and thick conifer forests. 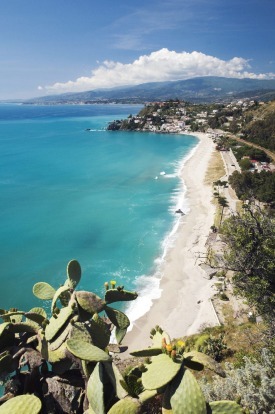 Most visitors to Calabria will make a beeline for the picturesque, umbrella-studded shores of Praia a Mare, on its north-west coast. But if you go the opposite direction - towards its eastern Ionian coast - you'll find a smattering of sleepy "secret" beaches with the same iridescent waters. The loveliest is the quiet Spiaggia di Caminia, a small, unspoiled crescent of pearly sand hidden between two steep cliffs on the Gulf of Squillace. Despite its dramatic beauty, it has remained a local secret and virtually tourist-free.